Conductor's Baton by Premier 12",14",16"
These well balanced, quality batons by Premier make lovely gifts for music directors, conductors and teachers. Each baton is perfectly balanced. Includes clear protective tube. Available in 12", 14", and 16" lengths. 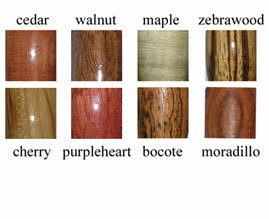 Available in Wood Types Cedar, Walnut, Maple, Zebrawood, Cherry, Purpleheart and Bocote. (Moradillo is no longer available). Please scroll down for more information about this product. a)Premier Baton's Scherzo model is specially designed to a traditional feel with its gently tapered design. e)Premier Baton's Overture model is specially designed to offer optimal grip with its hour glass shape. f)Premier Baton's Toccata model is perfect for the conductor who prefers a tapered tear drop shape. b)Premier Batons Ultra-Light Series - Rhondo (sorry, this one is no longer available). c)Premier Batons Ultra-Light Series - Staccato (sorry, this one is no longer available). d)New Premier Batons Ultra-Light Series - Larghetto (sorry, this one is no longer available).